Happy New Year and a big welcome to 2018 from everyone at the Old Peacock and Ossett Brewery. What a year 2017 was. For anybody in the pub trade the busy days and nights can seem relentless, and obviously the festive period can be intense and seemingly lasts forever. When you factor in that we are also a football pub that could not be any closer to the football club that we serve, and that club regularly attracts crowds of over 30,000, then you can imagine that life at the Old Peacock is something of a whirlwind. Depending on how our staff want to look at it, 2017 couldn’t have gone any better. From a Leeds United perspective it has been the usual rollercoaster of emotions. 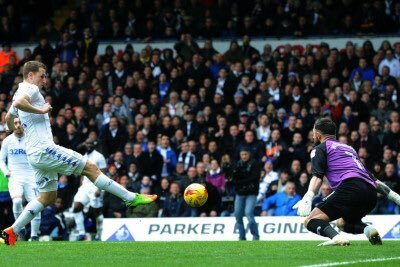 The year started with Garry Monk’s team looking certainties to reach the end of season play-offs, and the attendances at Elland Road reflected that. By April, however, all was not well and Leeds dropped out of the top six at the very last. It is inevitable with Leeds United that there is always interest in whatever they do, good or bad. It comes with the territory, and even as it looked like the wheels were coming off, the attendances didn’t drop, we were still seeing hordes of fans swarming all over the pub and making matchdays a unique and very special experience. Typically with Leeds United, it wasn’t particularly quiet over the summer either. Andrea Radrizzani completed his 100% takeover of the club as soon as the season had ended, Garry Monk resigned and Thomas Christiansen was appointed, plus a tidal wave of backroom staff, executive staff and playing staff came into the club. But undoubtedly the most significant event of the summer and the one that felt most poignant to us at the Old Peacock, was when the club bought back Elland Road from private ownership. Many people might not know this, but the Old Peacock pre-dates Elland Road by many years. For a long time the various guardians and staff of the pub looked out only on open fields and a dirt track. The pub can be traced back as far as 1826, but there is no evidence of a sports field where Elland Road now stands until 1878, and of course the ground didn’t start to develop properly until Leeds City took it over in 1904 and then Leeds United in 1919. This shows that the pub has always been a central part of the community and has always served the various industries around it. The football club and the numerous local businesses, and even the motorway network, have all arrived since the Peacock first opened its doors. So we only became a football pub when Leeds United grew and grew throughout the 20th century. However, we know how special Elland Road is and we know our place in serving its customers. We like to think we are just as much a part of the fabric, and as important to some fans, as the ground itself. So when the ground was bought back by the club is was a very special night, and we did find that the pub was busier than usual, on a filthy night shrouded by biblical rain, with fans just wanting to be at the ground and wanting to be part of such a historic occasion. Talking of historic occasions, Leeds United were top of the league just a couple of months later as we started the 2017/18 season like one of those greyhounds that used to race down the road. It was an amazingly exciting time, and while it didn’t last of course, we do feel that there is something special happening at the club now. There is a different feeling about the place and an air of optimism and pride that has been notably absent for a few years. On the pitch, maybe we won’t necessarily achieve everything we want to straight away, but fans can at least see the club moving in the right direction. Off the pitch, the external areas of the ground look so much better and we are really looking forward to the Bremner Square development starting soon. In between matchdays we continue to serve our regulars, plus staff from neighbouring businesses, including Leeds United, and of course fans who just love to make a midweek pilgrimage, and our food nights continue to be a great success, we also sold out our Christmas Day menu weeks in advance. In 2017 we established live music in the beer garden on matchdays, to really maximise the atmosphere that is created. The reaction has been fantastic. We have also introduced new bars, barbecue food on midweek nights when maybe you haven’t had chance to grab something at home in your haste to get to the game, and to help relieve the big queues on matchdays we have introduced two-pint pots, which have also been gratefully received. So we are all geared up for another blockbuster of a year in 2018. We ended 2017 with a run of home fixtures, as Norwich City and Hull City visited Elland Road on consecutive Saturdays, while we have already chalked off our first big game of the new year as over 32,000 came along to watch Nottingham Forest on January 1st. The outlook from now is decidedly more low key, however, with only a visit from our friends at Millwall to look forward to on January 20th. The only certainty is that life will never be dull around here, and even if Leeds United are largely responsible for that, we know that their fans can also bring something to the party. In closing we would like to thank all our fantastic staff for their hard work and patience throughout 2017, they really are the best in the business. They play an absolutely vital role in what we do and until you have worked an Old Peacock matchday I don’t think you can appreciate what a truly unique experience that is, and what a brilliant job they do. So thanks to all the staff and we know they are prepared for another year of fun, laughter and pulling pints. See you soon.